Make sure that the battery is fresh, and that the red lead of the battery connector is soldered to the "9V BAT+" point and the black lead to the "BAT-" point on the circuit board. Make sure you're using the recommended antenna, (6"-square plate) and that it is not touching anything except its connecting wire going to the "ANTENNA" pad on the printed circuit board. The antenna-connecting wire should not be too long; about 6" to 10" is right. If you have your Minimum Theremin in a metal box, be sure that the antenna-connecting wire isn't pressed against any metal surface. Make sure you adjusted the "ZERO CAL" potentiometer (blue rectangular part) on the printed circuit exactly as described in Step 25 of the Assembly Instructions. Make sure your amplifier-speaker system is working correctly. Check for a faulty connecting cord to the audio amplifier or a problem with the amplifier, especially if a 60 or 120 Hertz "hum" is evident. If you have a different amplifier and connecting cord available, we recommend that you try them for comparison. Poor fidelity may be caused by interference from a nearby source such as a fluorescent lamp, computer monitor, or appliance. You can determine if the problem is being caused by interference by moving your theremin to another location, away from electrical devices, and seeing if there is an improvement. Verify that all the parts are in their correct positions. Verify that the POLARIZED parts (C5, C6, C7, C8, CR1, CR2, CR3, U1, U2, VR1) aren't put in backwards. Make sure all 14 pins of each U1 and U2 have been pushed through the board. Make sure that none of the wire leads have broken off their component bodies, and that none of the components look excessively discolored or charred from too much soldering heat. Make sure that none of the conductive traces on the printed circuit board have been burned away by excessive heat or abrasion from soldering. Check the kind of solder you used, and make sure that it is one of the recommended types, or equivalent, to those described in Step 2 of the Assembly Instructions. Improper solders may leave a conductive residue that prevent correct operation. Look at all the soldered connections carefully with a magnifier, under a bright lamp, to make sure there aren't any fractured solder joints or "solder bridges" between adjacent points. This may happen where points are close together, such as with U1 and U2, or the two closely-spaced points for electrolytic capacitors C5, C6, C7, or C8. Large "globs" or "peaks" of solder on a connection may hide the fact that the solder has not adhered to both the protruding component lead and the board's conductive pad. Good solder joints will have a thin application of smooth solder that conforms to the contour of the component lead and flows smoothly onto the pad. The contour of the component lead should be clearly visible under the solder, and there should be no "voids," or little air holes, in the connection. For conventional tin-lead alloy solders, the connection should have a bright, smooth appearance with no cracking. The appearance of connections made with lead free (tin) solders will have a duller, somewhat coarser appearance, but should otherwise have similar characteristics to connections made with tin-lead solder. Improper soldering, especially the application of too much heat, may result in the discoloring of the solder pad's surface and/or the component lead. In such a case, the solder, itself, may also look dull and have a darkened, charred appearance. This discoloring results from oxides on the metal surfaces, and may prevent a good electrical connection between the component lead and the circuit board pad. 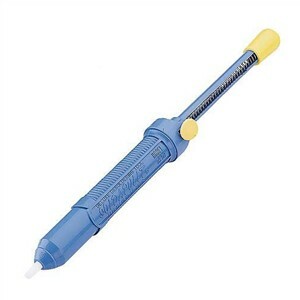 If such discoloring is evident, then it is advised that all the solder is removed from the connection with Soder-Wick® or a vacuum desoldering tool. Then the metal surfaces should be gently scraped so that the oxidized surface is removed, and fresh metal is exposed. This may be done with a fine-blade hobby ("X-ACTO®") knife, however, take care not to completely sever the thin metal traces that connect to the pad. Once the pad and lead are cleaned, the connection may be resoldered. Inspect the top (component side) of the board for solder globs between adjacent leads, especially the close-spaced leads of U1, U2, and VR1. 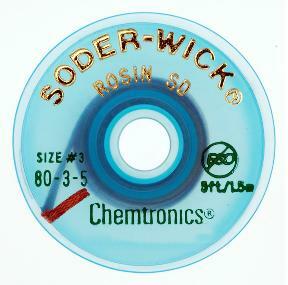 Such excess solder may cause short-circuits, and must be removed with solder wick. Note that almost all problems with the Minimum Theremin result from improper soldering. Make sure the wires to the output jack are not accidentally reversed. Make sure that the ON-OFF switch is properly connected. One of the wires to the ON-OFF switch should go to to its center terminal. Make sure that the three wires to the ZERO potentiometer are connected properly. If your Minimum Theremin still doesn't work, please contact us for assistance.